Dantes Inferno is superb in many ways and has kept me engrossed for many hours as I have attempted to get to grips with this bonkers adventure game. The game has a really good story line which is backed up with some of the best graphical content I have ever seen which makes it an instant hit for me. 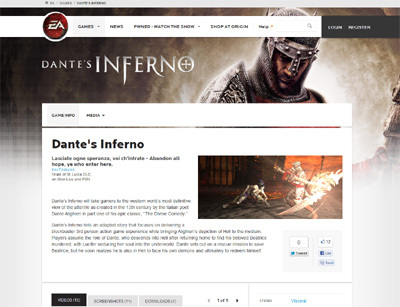 We have also compiled a Review System for this, of which Dantes Inferno is Rated as Four Stars, the second highest possible score available from the Game Review Team.